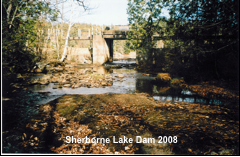 Inflow is controlled by a dam on Sherborne Lake, which flows into St. Nora Lake. Outflow is through the Buckslide Dam into Boshkung Lake. These dams are owned and managed by TSW as flood dams used to maintain water levels for navigational waters and habitats downstream. The Sherborne was a lumberman’s dam built of wood, refitted with new timber in 1930 and concrete in 1971. The Buckslide Dam was built of wood by the Gull River Lumber Company at the turn of the century and reconstructed in concrete in 1971. This dam is referred to as the Kashagawi Dam in MNR Lake Trout spawning reports in the 1970s and 80s. Buckslide is one of the most spectacular cascades of water in Haliburton.It is named after Daniel Buck owner of a lumber mill at the end of Kushog Lake where a timber slide was constructed to navigate the tumultuous waterway. Buck's timber slide was known casually as "Buck's slide" and the road to Buck's slide eventually became Buckslides Road. Buckslides, painted by Group of Seven member A.J. Casson in 1938, is best viewed from the road, which allows observers to avoid private property.